Sabahans think that she should remain in the UK and highlight the plight of Sabah and Sarawak in the Federation with the peninsula. KOTA KINABALU: The legal fraternity in Sabah are unanimous that local freedom fighter Doris Jones @ Doris Yapp Kim Yuon who heads the UK-based Sabah Sarawak Union-United Kingdom (SSU-UK), an NGO behind the Sabah Sarawak Keluar Malaysia (SSKM) Facebook page, cannot be deprived of her citizenship. 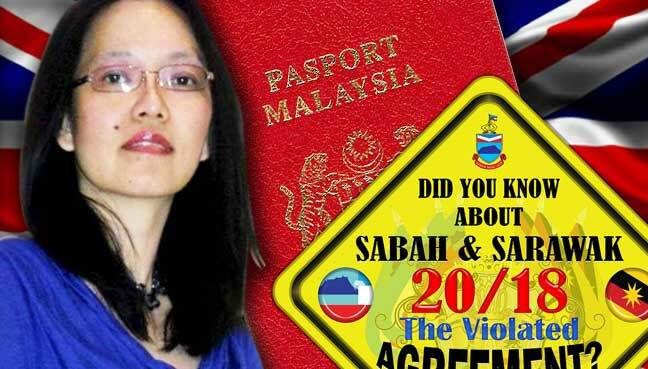 “Canceling Jones’s passport only restricts her ability to travel and does not strip her of Malaysian citizenship,” said lawyer Tengku Fuad Ahmad who represents four SSKM volunteers facing sedition charges in Sabah. Sabahans in general think that she should remain in the UK and continue to highlight the plight of Sabah and Sarawak in the Federation with the peninsula. “I don’t see what useful purpose can be served by her returning and ending up behind bars,” said Daniel John Jambun, the President of the UK-based Borneo’s Plight in Malaysia Foundation (Bopim).